At the fifth Eastern Partnership summit in Brussels on Friday (24 November), Armenia and the European Union signed a new framework agreement, dubbed the Comprehensive and Enhanced Partnership Agreement (Cepa). The Cepa came in to replace the old Partnership and Cooperation Agreement (PCA) from 1999 - long overdue, since Yerevan wasn’t able to sign its earlier negotiated Association Agreement, including a ’deep and comprehensive free trade agreement’ (DCFTA), back in 2013, due to a Russian blackmail to join the Eurasian Economic Union (EAEU). It took Yerevan and Brussels two years to reopen negotiations and two more to negotiate a new agreement, often referred to as an ’Association Agreement-lite’, which has kept most provisions from the old AA. Cepa doesn’t contain free trade arrangements, however, as that is now beyond Armenia’s jurisdiction and within that of the EAEU’s. The new agreement is thus a compromise between the old AA and Armenia’s new commitments following accession to the Eurasian Economic Union. Following the fallout of the Eastern Partnership initiative and an overhaul on the part of the EU of its European Neighbourhood Policy (ENP), the new agreement between Yerevan and Brussels was cautiously calculated to avoid a possible repetition of 2013. The common sense is that Moscow has been kept informed all along to make sure that it is on the same page with Yerevan - although, arguably, that had been the case with the failed Association Agreement as well, so tension remained until the deal was done. Both Yerevan and Brussels have kept a rather low profile - characteristic to EU-Armenia relations in general - throughout the negotiations. Cepa was initialed unexpectedly, without prior notice or indication, in March 2017, and the agreement’s text was officially made public in October 2017, a month before the Eastern Partnership summit. This was perhaps intended to avoid speculation about the contents of the agreement. Political context has played its role too. Armenia in 2013 was the first ’clashpoint’ between the EU and Russia in what escalated further with the events in Ukraine. By 2017, with Armenia in the Eurasian Union, Moscow perceived the signing of the new agreement between Yerevan and Brussels as less of a threat. The signing of the Cepa is a milestone in Armenia-EU relations. 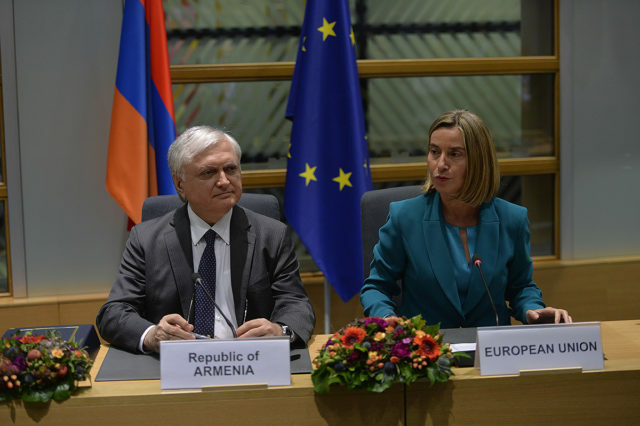 Politically, both Yerevan and Brussels ’win’, in having reached a middle ground that combines Armenia’s EAEU membership with an upgraded agreement with the EU. This gives Armenia a degree of its long-nurtured political balance. And Brussels demonstrates adaptability in ensuring that the EU and EAEU can co-exist in the post-Soviet space. Second, Cepa pulls Armenia out of the group of Eastern Partnership ’laggards’, namely Belarus and Azerbaijan, where it found itself after failing to sign the AA together with Georgia, Moldova and Ukraine. Minsk and Baku are either not interested or have not yet signed similar agreements with the EU. Cepa thus embodies the principle of differentiation - a key element in the reviewed ENP - which implies a tailored, rather than one-size-fits-all, approach in the EU’s relations with its neighbours. This sets the Eastern Partnership’s current format to 3+1+2. However, for Armenia the Cepa is also the second best option; it is still a departure from the more sophisticated Association Agreement which contained more benefits. Importantly, the underlying causes that hindered the latter’s signing still continues to pose a challenge to Armenia. While Armenian policy-makers are likely to boast that they have, after all, managed to achieve their original policy goal of ’and/and’ (as opposed to ’either/or’) vis-a-vis European and Russian integration projects , the balance is tipped in the direction of EAEU, which ties Armenia’s hands in trade arrangements with third parties. While in strategic terms Yerevan acquires a degree of diversification by signing a new agreement with the EU, the mere signing of Cepa will not alter the balance of power in Armenia’s foreign policy. There is a risk that for Armenia the bar will be lowered, as regards foreign policy diversification, to the Cepa-signing only. The Armenian government will have to work in other directions as well to truly achieve this goal. Ultimately, Cepa’s rewards are hidden in its implementation. It offers EU tools and money to facilitate reform across different sectors. Among Armenia’s civil society and progressive circles, EU is seen as the only driver of the country’s modernisation, while Cepa is expected to create an enabling environment for reforms. The EU, in turn, will need to continue to empower Armenia’s civil society for the latter to have a bigger say in policy decision-making and carry out oversight of Cepa’s implementation. But adhering to ’common values’ and building a truly democratic and corruption-free European state will mostly depend on the Armenian government’s political will, and it still needs to prove that all this is not mere rhetoric. The clauses of conditionality in Cepa are not strong, and they are anyway unlikely to be invoked for political (in)expediency reasons. But the Armenian government needs to heed another ’conditionality’ – the one enshrined in the social pact between the state and Armenian citizens.